Please wait while we build your star pack! 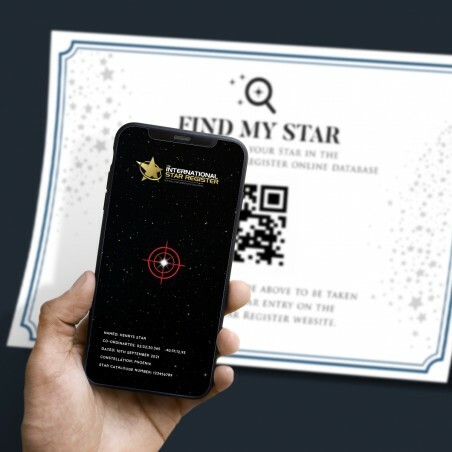 • A combined Certificate of Registration and A3 Star Chart Scroll, showing the exact location of your named star with astronomical co-ordinates. • A personalised star mug with the details of your own name a star digitally printed onto a spectacular star photo background. The mugs are made from high quality ceramic, which is safe for use in your dishwasher, for a durable, high gloss finish. • Packaged in an attractive presentation gift box. i Choose a name for your star, eg. the first name, nickname etc of the person you are naming the star for. i The name of person you are naming the star for. 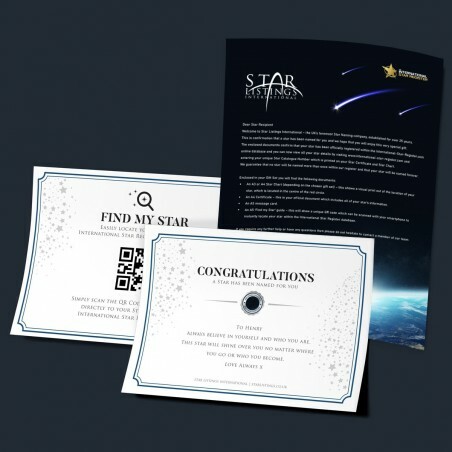 This will appear on the certificate and in our listings as the person to whom the star name is registered. i Please choose from one of the occasions listed. i Please specify the date of your star name registration, for example the date of someone's birthday, please enter the date. PLEASE USE FORMAT: DD/MM/YYYY (eg: 31/12/2016). i Your Star will be allocated in your chosen constellation. i This is normally the Recipients Name. This is the name shown on your message card. Do not include any symbols such as :) as these will not reproduce. i Message to be shown on the message card. Please do not include any symbols such as smiley faces/hearts etc as these will not reproduce correctly. i This is the 'from' name shown on your message card. i You can use this space to give us any extra information you think may be helpful. This will not appear on the message card. Please ensure all spelling and details are correct before continuing. Please note: Only click 'Add to Basket' once, as clicking multiple times will add more than 1 gift set to your order basket. Sign up to our mailing list to get your unique discount code! The gift was perfect! It came beautifully presented! So much better than what I was expecting, I will be ordering again! Purchased the Downloadable Gift Pack for a last minute present. Was emailed the certificate and PDF instantly. Very easy to print! These gift sets are presented beautifully, I have purchased 3 now and never been disappointed with the quality! Ordered the Deluxe gift pack for my nephews Christening! I was amazed at how well it was presented! Arrived on time and was exactly as pictured on the website! Phoned to get some advice on constellation, very helpful! If you are unhappy with your gift for any reason, simply return it to us in its original conditional within 30 days for a refund. Full details can be found in our FAQ section. We accept the following credit / debit cards & PayPal. All transactions are processed securely and are protected by Verified By Visa & Mastercard.